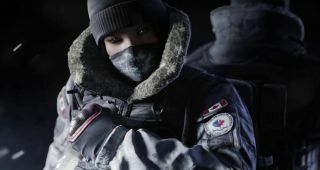 We learned yesterday that the new Rainbow Six Siege DLC, Operation Black Ice, would be out today, and that it would feature a pair of Canadian special forces operators, Hosehead and Moose—sorry, Frost and Buck—doing their thing on some rich guy's superyacht, that's somehow managed to become almost completely encased in ice. Today, Ubi released a brief trailer showing the new duo in action, and it's... well, it's really something to see. What impresses me most is the way the video manages to showcase the unique hardware that each soldier brings to the field, that being a shotgun for Buck and a leg-hold trap for Frost. First, Buck vaporizes a guy by shooting him in the back—through a window, no less—and then Frost comes upon some poor dummy caught in her trap and proceeds to shotgun him in the junk not once, not twice, but four times, including once after he's clearly dead (or really, really wishes he was). Around these parts, we call that the Moose Jaw Kidney Punch. It's the sort of assault that would be incredibly uncomfortable to watch if it wasn't so breathtakingly hilarious. And why are there only two JTF2 operators to secure this entire, massive yacht? Because the other guy is parking the truck. Hey, I'm Canadian, I get to make these jokes. Rainbow Six Siege: Operation Black Ice is available now to season pass owners at no charge. Players without season passes will be able to unlock the characters with Renown or R6 Credits beginning on February 9.